More than 4,000 people signed a petition against East Staffordshire Borough Council's proposals for Burton-upon-Trent Market Hall. The plans include the use of "pop-up" stalls instead of permanent shops to allow the building to be turned into a music venue at night. Some outdoor stalls are due to move inside the venue for the first time. The council said it would bring all food sellers under one roof. Other stalls in the outdoor Market Place are due to move to Station Street by November, which some stall owners said would damage sales. East Staffordshire Borough Council said the move would allow easier access to the market hall and enable events to be held at key times such as Christmas. The council's head of finance Stephen Hinds said disruption would be kept to a minimum during the refurbishment. Council leader Richard Grosvenor said the changes would revitalise the market hall and retailing across the town. Julie Stanley, 52, who has run a jewellery shop in the market hall for the past 10 years, said the decision left non-food retailers "high and dry". She said the local authority had not been able to confirm whether her business would be able to stay after the refurbishment. "We know there's going to be change, but it is devastating. Our livelihoods are at stake," she said. Ms Stanley added that the outdoor market attracted shoppers into the hall and, without it, business could suffer. 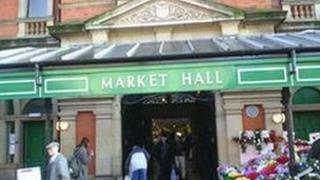 A council spokesman said the Market Hall itself would host a variety of stalls, not just food-related businesses. "Existing traders are part of our plans to regenerate the market," he added. Albert Widdowson, 70, who sells net curtains and fabrics, said a "pop up" stall would mean stock having to be set up every day. Mr Widdowson, who has run a stall at the market for 54 years, said trade had declined with an increase in the number of budget retailers on the high street. Some traders, including Ms Stanley, had tabled an alternative proposal, which included retaining the current fixed stalls for existing retailers, while making changes to the central layout. The traders also suggested optional short leases to encourage young entrepreneurs.